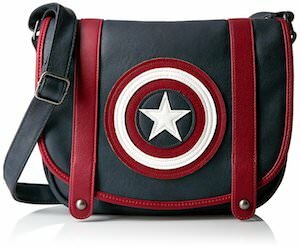 If you are in need of a cool bag and you like superhero’s then you should check out this Captain America handbag. 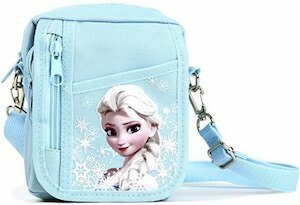 This is a crossbody bag that looks like leather but isn’t and is dark blue in color with red details and on the front you find the shield of Captain America on it and it is all neatly sown on the bag so that it really looks stunning. The Captain America handbag is 10 inches tall and 10.5 inches wide and comes with an adjustable shoulder strap. The bag has a magnetic closing system and inside you also find a smaller pocket with a zipper for stuff you don’t want to get lost in the big compartment of he Captain America bag. 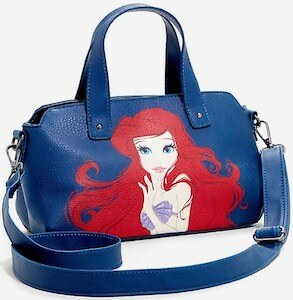 If you like Hello Kitty and you like fun handbags then come check out this bag made by Loungefly. The Hello Kitty bag is round and red with a nice red adjustable strap so that you can hang it over your shoulder the way you like it. 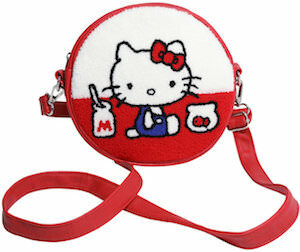 The Hello Kitty bag has a diameter of 8 inches and shows Hello Kitty sitting next to a fishbowl and a bottle of milk. 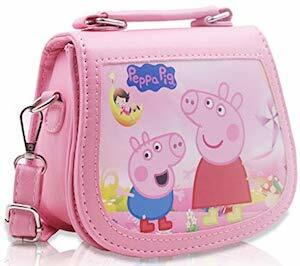 Inside the Hello Kitty bag, you find a little pouch pocket so that you can separate stuff and the main compartment has a nice zipper to keep things securely stored. 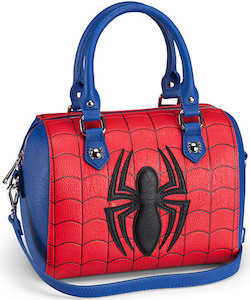 If you like Spider-Man and need a fun handbag then look no further as this is a Spider-Man handbag that just looks amazing. 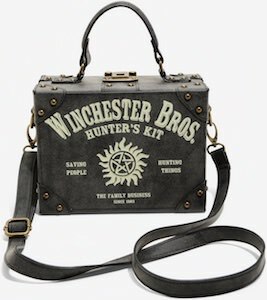 The women’s purse is red and blue with black details. 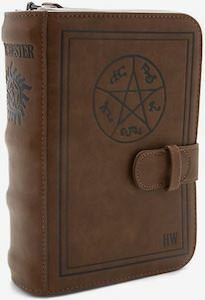 As you can see the front shows the Spider-Man logo against a red background and has two carry handles on top of it. Besides a handbag, you can carry in your hand this Spider-Man bag also has a removable shoulder strap so that you can hanging it next to your body. The Spider-Man handbag is 10 x 6 1/2 x 7 1/2 inches making it the perfect size to carry the essentials. Now there is a Guardians of the Galaxy handbag that is just what fans of Star-Lord want. 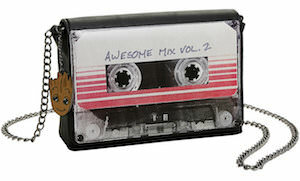 The bag looks like a cassette tape and it is Awesome Mix Vol. 2 so you know it’s based on the second Guardians of the Galaxy movie. 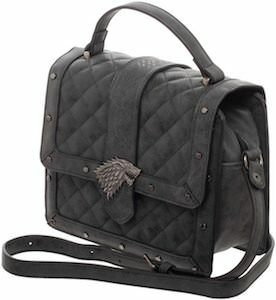 The handbag is made by Loungefly and has a metal chain so that you can hang it over your shoulder and on the side of the bag there is also a Groot charm to make it, even more, Guardians of the Galaxy worthy. The Guardians of the Galaxy bag has a magnetic close mechanism and inside there is a zipper closed pocket too.